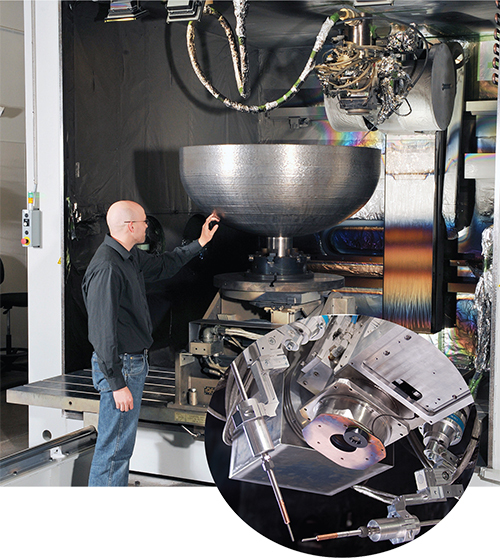 Sciaky, Inc., Chicago, IL, introduces the IRISS closed-loop control for its electron-beam additive-manufacturing (EBAM) systems. IRISS (interlayer real-time imaging and sensing system) provides consistent process control for metal-part geometry, mechanical properties, microstructure and composition for large-scale 3D-printed parts. The closed-loop control monitors the metal-deposition process in real time and makes adjustments to process parameters to compensate for any variation throughout the build process. EBAM systems use wire feedstock available in a variety of metal alloys including titanium, tantalum, niobium, tungsten, molybdenum, Inconel, aluminum, stainless steels and nickel. They can produce parts from 8 in. to 19 ft. long with gross deposition rates from 7 to 20 lb./hr. And, by using a dual wire-feed option (photo), manufacturers can combine two different metal alloys into a single melt pool to create custom-alloyed parts or ingots, and can even adjust the mixture ratio of the two materials to create graded parts or structures.